After the disaster I had with the last berry filled pastry for French Fridays with Dorie I wasn’t sure I would attempt another one… I’m happy to report that my berry financiers were a total success and I was excited to use the financier molds that were a gift from a friend and have been stashed in my kitchen for several years. Traditionally financiers are made with brown butter and I think have a wonderful chewy texture from almond flour. The mixed berries nestled on top are a kind of icing on the cake of this beloved Parisian born sweet. 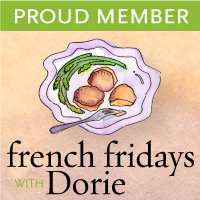 The cooking schedule of the online cooking group French Fridays with Dorie features seasonal recipes selected from Around My French Table. This week’s recipe with the option to use fresh berries is perfect for this time of year and I hope it inspires everyone to make it over to their local farmer’s market and load up on berries. Instead of a chicken in every pot maybe we could have berries in every bowl. Even though I haven’t been a regular participant with French Fridays with Dorie, I try to keep up with the cooking adventures of this wonderful group. Please venture over to check out all the home baked financiers shared on the site this week. I think we’re skipping over Spring here in the Bay Area with temperatures in the high eighties today. Believe me I’m not complaining but I think the garden may wonder what’s going on with these temperatures. Between the frogs, birds and a gazillion bugs that just hatched we are good to go for Summer! I’ve made so many excellent keeper recipes out of Around My French Table..I guess I should give the Isaphan Loaf Cake another try…How about on a warm Summer day? I will bake a beautiful loaf (early in the day before it gets too hot!) and serve it with ice tea sweetened with my homemade rose syrup. I’m feeling another FFWD inspired blog post coming on…..Hopefully I won’t wait until July to share another recipe From Around My French Table. Here is a link to Dorie Greenspan’s recipe for financiers with the addition of fresh berries nestled on top of the batter before baking. Beautiful financiers, Patty! I’m sure the berries taste wonderful with the nutty brown butter! Wow, Patty! I had no idea what these were supposed to look like, but yours are just gorgeous! I would love to have these pretty pans. I made the chocolate version with Blackberries. I’d take berries in every bowl, over chicken in every pot, any day. Especially if I could enjoy the berries atop these wonderful financiers! Wouldn’t be wonderful if we could actually use financier cookies instead of money? The world would my much happier, methinks. Patty, these are absolutely lovely! Please send some over, along with your 80 degree temps! These are gorgeous and perfect for spring (weather here in Georgia is a little odd also)! Gorgeous….absolutely gorgeous, Patty!! I made mine in little tart molds, too! I loved these…they were so delectable! I will be making them again! I like the idea of a berry in every bowl Patty! After my Isaphan failure I tried again and had better luck with the cake but we just didn’t like it very much. No more ‘perfume’ cakes for us! I haven’t mixed my financier dough yet but my butter is softening. I have a Williams Sonoma gift certificate and I might run up there for some cute little tart pans! Yours look great! Have a nice weekend with your beautiful weather. Its 38 here in Oklahoma this morning! These financiers are absolutely gorgeous, Patty. The moulds are so pretty too. Oh, Patty…these look like the perfect compliment to my coffee this morning! They look so light and fresh! Absolutely lovely!!! I’m looking out my window at snow, and feeling quite envious of your beautiful weather. Unfortunately, there are no berries in our farmers’ markets yet. But your financiers are gorgeous – wish I could eat one right now! These are beautiful Patty. I think I could eat a dozen on a nice Spring afternoon. The berries tucked in are calling my name. We went from 80′s in one day down to 38 at night with crazy storms with tornadoes, never know what Spring will bring. Oh, Patty, you are an inspiration. I actually looked for the little molds like yours at a hotsy-totsy kitchen store and had no luck. Yours are incredibly beautiful. Did you go with the brown butter technique? I did and I think it makes them even better. But nothing can be prettier than yours. Doesn’t it make you feel good to create/bake something fantastic after being so disappointed with one of your other recipes. Actually, I’ve had more fails that wins but I probably learn more from the fails. (I prefer a Win, however.) Mine aren’t as pretty but they are definitely yummy. How beautiful these little treats look and your shots of the are great. I love Dorie’s recipes! These are beautiful. I love the shape and the berry addition. When it comes to anything and everything French, you know that I’m in wholeheartedly! I am crazy over financiers – my fave French pastry treat! The addition of berries is quite delicious! It adds a little razzmatazz to these buttery goodies! I am so loving this weather that we are having! I really want to put my cushions out on the patio furniture but I know we probably have a rain storm or two left. These financiers look perfectly divine! Never made them before but now you have inspired me. Happy almost weekend! So pretty and light, I love all the berries going around right now! Wish we could get spring to arrive here in CO! Gorgeous, Patty!!! What fantastic molds, too. Patty – I just LOVE your photography and styling – always so vivid and classy. Yes, our thinking about these cakes was very similar.. but hey we were surprised. .. I really like your pans. Beautiful presentation. These are so gorgeous and spring-timey! They look so perfect for an outdoor party! The shape and the berries make them so gorgeous! And if the weather´s hot they are a good idea since the batter keeps in the fridge and there´s minimal oven time. Enjoy the good weather Patty, and have a great weekend! Why, your berry financiers are truly a work of edible art! I keep reading about difficulties the bakers had with the Isphafan cake- I did not get to that one- perhaps I should consider it a challenge! SO pretty and delicious sounding! Sorry that you’re skipping over spring over here. We’re still stuck in winter. I’ll have to go check out the recipe because these sound delightful and perfect for the hopefully coming spring! Patty, your molds are some of the prettiest I have seen – just the perfect ones for these dainty little French tea cakes. And,of course, the addition of these colorful berries is so very creative and just perfect for these tender cakes! I adore Financiers! Seasonal berries floating atop the buttery cake are just scrumptious! Patty, these are so gorgeous, I’m glad you didn’t give up. I don’t have a financier pan but I do have a mini (and I mean really mini) bundt pan, makes 12 cakes, that small. I may try and make up a batch, these are just too pretty not to try. It’s fun to see the authentic shape. Tres elegante! And those berries on top! You are in California and are far ahead of us. We’re two months away from fresh local berries, but I will make these again when they arrive. Have a great weekend! It’s nice to “see” you this week. Your financiers are so pretty Patty – they sing of spring. So glad you could join us this week for such a super treat. Stunning photos of your financiers, Patty! I like that – ‘berries in every bowl.’ I love that you used three different berries and the shapes from your molds are so beautiful. We seem to have sailed right into summer in the valley here as well, but we are supposed to have more spring-like temperatures for the next few days. I’ve only made financiers once and they didn’t came out as good I as thought. I’ve gotta give them another try. Your berry financiers look lovely and delicious. Not to mention, super elegant and beautiful too. I’m so jealous. It’ll be a while still before we start getting berries at our farmer’s market. Your financiers are beautiful. I love the mixed berry look. These are just beautiful, Patty. I bet those financier molds won’t have to wait years before being used again. Love these. Beautiful financiers!!!!!!!!! I saw this earlier on IG and had to check it out. Sigh. I really need lots of baking supplies (I’m a late bloomer for baking), and I have to make molds like this! Great choice to put berries. They look pretty like jewelries! I’ve finally gotten round to making these and reading everyone’s posts. Yours are so pretty, with their fluted edges and beautiful berries! We’re still waiting for local berries here, but I’m looking forward to bowl(s)ful, soon!